Whether you are spending four hours or longer with us, all the adventures starts the same way at the Parachute HQ with a talk about the day ahead, the geography of the site and facilities and most importantly, the safety briefings. Have you ever wanted to know how to survive in the wild but didn't know where to start. well look no further. 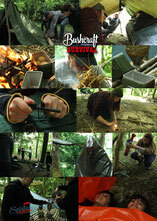 We can show you how to light fires, build shelters and use bushcraft tools such as knives and axes to make useful camp tools. Wether you choose 4 hours or the longer 2 day overnight camp we know you'll have plenty of fun and excitement learning new and interesting skills.